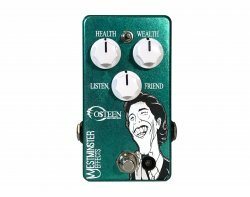 When you want raunchy yet crisp, full, amp-like high gain goodness, look no further than the O$teen Di$tortion. Listen, friend, you don’t have time in your life to not Make Every Note a Solo, so sow your seed of $149.99 to pump your tone full of health and wealth. Also features soft touch relay bypass. Listen, Friend - Controls the output volume. Wealth - Controls the amount of gain in the circuit. Health - A typical tone control. Straight up is flat. To the left darkens your tone, and to the right brightens it. Clip - A three-way switch with loads of different voices. Flip it down for warmer, up for tighter, punchier sounds, or put it in the middle to split the difference.